On June 23, 2017, Joshua Taylor was in a very serious dirt bike accident. He fell 50 feet down a ravine. He was wearing a full helmet that was fastened, but it somehow came off before it could do much to help. Because he was in a remote location, he wasn’t rescued for some time. 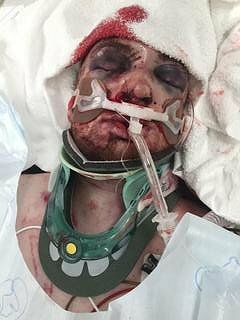 His injuries were very severe, including “devastating head trauma,” a collapsed lung, a punctured lung, and a broken rib. Unconscious and unrecognizable, Josh was flown by Life Flight helicopter to the Oregon Health and Science University (OHSU) Hospital in Portland, OR, where he was rushed into emergency surgery. He was not expected to survive. 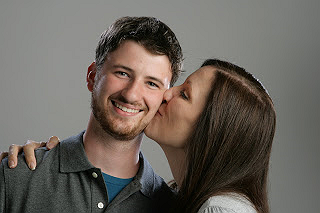 Josh was in a coma and on life support until he woke up on Sunday, July 2nd. 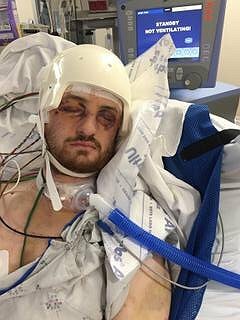 Josh was in the ICU for 2 weeks and it now appears that he will survive. His brain injury is obvious and he is blind in his right eye, but medical staff think he will someday walk again. He will have to endure roughly a year of physical therapy. After medical insurance covers their part, the average expenses for this injury are expensive and include home health care, rehabilitation and doctor’s visits. In addition, family members are exploring various cutting-edge facilities that specialize in TBI (traumatic brain injury) therapies. Attending these will most likely require relocating to another part of the country for several months or more. 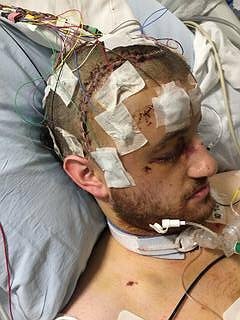 To help with the financial burden of uninsured expenses, a fundraising campaign has been established in honor of Josh Taylor with Help Hope Live, a trusted nonprofit organization that has been providing community-based fundraising guidance to help patients and families in need for more than 30 years. All donations are tax deductible to the full extent of the law and are held by Help Hope Live in the Northwest Traumatic Brain Injury Fund in honor of Josh Taylor. Donations are allocated by Help Hope Live based on financial need for medical expenses. We know that it is through the generosity of others that Josh has achieved the independence he enjoys today. We are hoping that through fundraising with Help Hope Live we can help Josh have a brighter future too. Please consider making a donation today. For credit card contributions, please click on the Donate Now button. Josh, you will be in my thoughts and prayers! Don't be picture shy! We all here will love watching your progress. I'm so sorry that you have to walk this road. We love you all and hope and pray for better days soon. Keep fighting hard Josh! You can do this! I love you man!